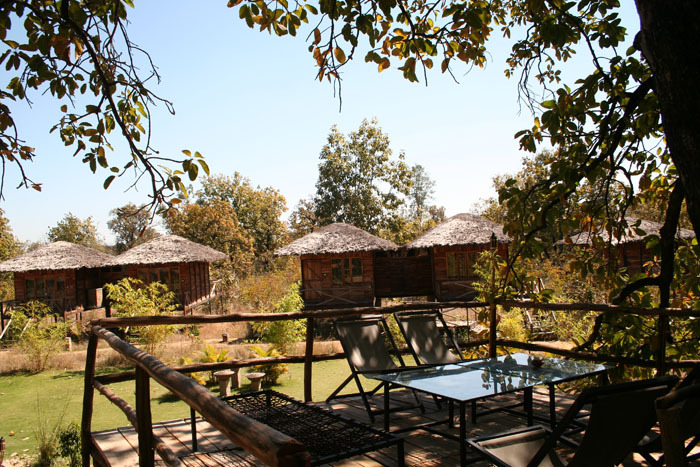 Welcome to TRIBAL CAMP at the PENCH TIGER RESERVE, Madhya Pradesh, India � a resort with wooden huts and rustic appeal, that has been designed to create an experience of living in nature, with nature! 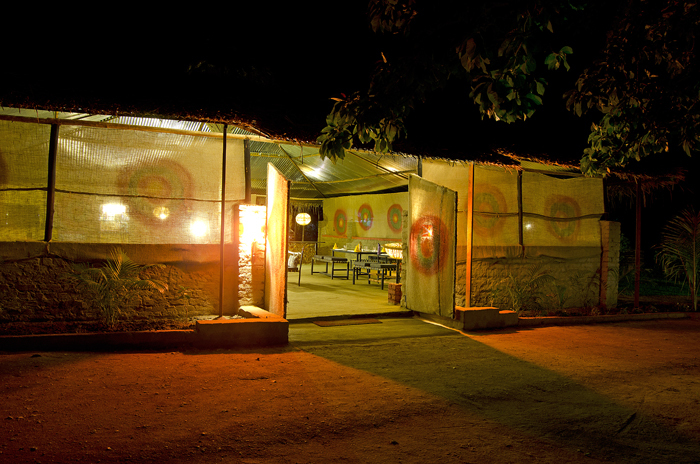 Located in the Seoni District, Thesil Khurai, approximately 115 kms from Nagpur, TRIBAL CAMP is conveniently located in the thick of the buffer of the Pench National Park. 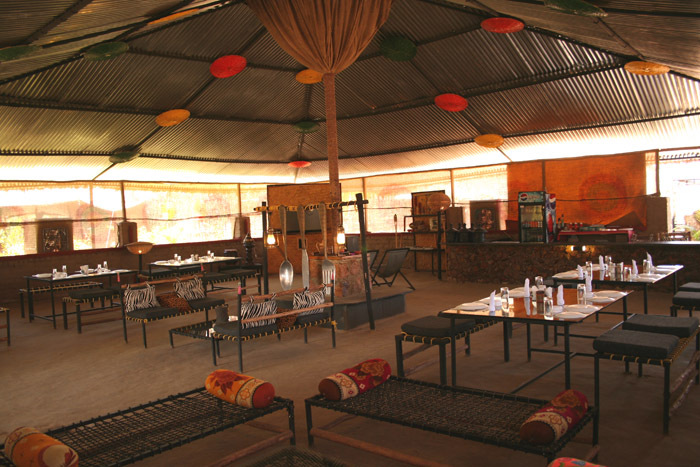 Nestled cozily in the wilderness amidst the flora and fauna of Pench, home to Mowgli, TRIBAL CAMP is an enticing getaway from urban contemporary living. The total area under the Pench Tiger Reserve comes to about 758-km, out of which a core area of 299-sq-km is the National Park and 464-km the buffer area. Pench National Park, nestling in the lower southern reaches of the Satpura hills is named after Pench river which flows from north to south through the Pench National Park. It is located on the southern boundary of Madhya Pradesh. Recently in 1992, Pench has been included under the umbrella of "Project Tiger" as the 19th Project Tiger Reserve. A total of 758 Sq. kms of this Southern Indian tropical moist deciduous forest has its extent mingling with the tropical dry deciduous teak. The area is crisscrossed by a number of streams and 'nallahs' most of which are seasonal. Though the Pench River dries up in April end, a number of water pools locally known as 'dohs' are found which serve as water holes for the wild animals. The Pench Reservoir at the center of the park is the only major water source during the pinch period. As a prey concentration is high along the Pench River, tiger usually inhabits frequents this belt. Leopard though generally operates in the peripheral areas but are occasionally seen in the deep forest also. Jungle cats are commonly seen. Leopard cats, small Indian civets and palm civets are common but seen rarely. In Pench, Cheetal, Sambar, nilgai are commonly seen grazing on the open sites on roadsides and banks of river & reservoir. Jackals can be seen in search of food anywhere in the Park. Packs up to 15 of wild dog can be seen near Chhedia, Jamtara, Bodanala and Pyorthadi areas of the Reserve. Herds of gaur can be spotted near streams and bamboo patches commonly in summer months. Sloth beer occupy hilly, rocky out crops and favour mahul bel infested forest. Chnkara is present in very small numbers and is found in open areas around Turia, Telia and Dudhgaon villages. Langoors are very common in Pench, whereas the Rhesus monkeys may be seen occasionally on the fringes. Pench boasts of, more than 210 species of birds that include several migratory ones also. Commonly seen are Peafowl, Red jungle fowl, Crow pheasant, Crimson breasted barbet, Redvented bulbul, Racket tailed drongo, Magpie robin and lesser whistling teal. NATURE WALKS - Getting up-close to nature is fully experienced only when you venture out and feel the emotions she exudes. Learn everything about the flora and fauna of the region from our naturalists who will lead you on the trail. BIRD WATCHING - Bird watching in Pench is an excellent pastime with over 210 species of birds being recorded here. The Pench region is dominated by dense forests, but you can also find patches of shrubs around the periphery as well as a lot of cultivation around the area. The water bodies inside the park act as an attraction to a wide variety of water birds. Even when the water bodies recedes, it leaves isolated pools of water that attract a multitude of birds as fishes are trapped in them. 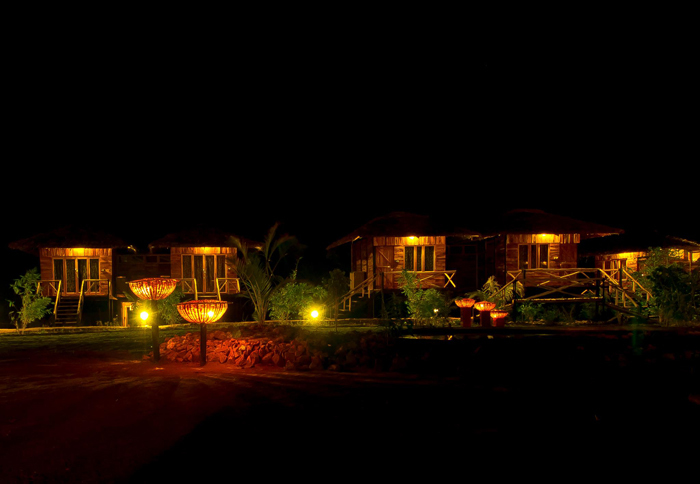 Star gazing & Night Safari - One of the nicest things about a resort in the wilderness is the beautiful clear sky above. In the jungle due to almost zero pollution ,at night the sky is full of millions and millions of bright twinkling stars, which you dont ever get to see in the city, and people often rememorize their poem of the twinkling stars of their childhood all over again. 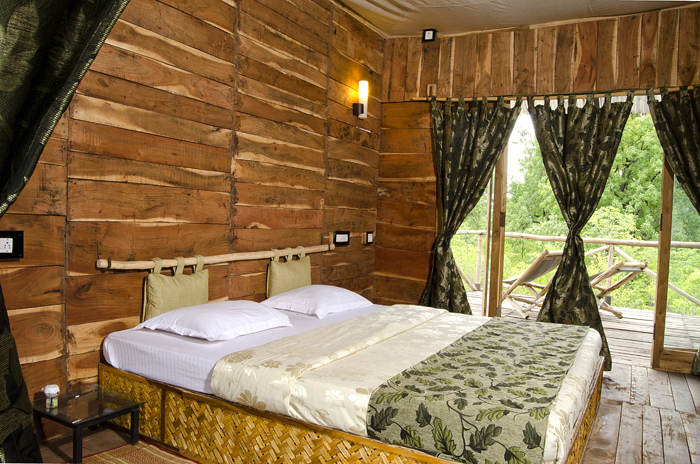 Jeep Safari, Elephant Safari, Wildlife movies, Folk dance, Badminton, Carom, Bonfire dinner with Bar-be-Que, Bird watching with expert naturalist.